For over 30 years David Hartill has been turning dreams into reality. We offer a full design and installation service for kitchens, bedrooms and home offices. Our showroom move to the Church Stretton area will help in providing more competitive quotations, whilst ensuring the same level of care and individual approach for our clients requirements. On this website you will find just some of the wide range of designs and styles of kitchen, bedroom and home office furniture. We offer several ranges of kitchen from individually handmade units on a variety of styles, timbers and colours to an excellent quality range of standard furniture that offers both contemporary and traditional styles. 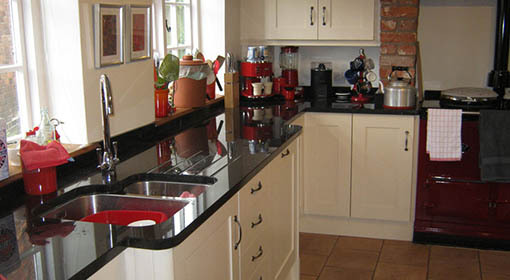 A selection of granite worktops, laminates and fabricated worktops are available. Small building alterations can also be undertaken. All the fitters, electricians and tilers possess many years experience within their trades, work to the highest of standards and have been working alongside us for many years. Showroom viewings are by appointment – please telephone or email to arrange at your convenience. David Hartill fitted a kitchen for us and the quality of workmanship, service and overall customer experience was first class.